Who Is In The Middle For Our Next Game? Rotherham United’s trip to the DW Stadium to take on Wigan sees referee Scott Duncan from Northumberland in charge. Scott was last in charge of a Millers game for the League One Play-Off semi-final at home to Scunthorpe. The Millers won two-nil with goals from Richard Wood and Will Vaulks while the Iron had Rory McArdle sent off thirteen minutes from the end of the game after getting his second yellow of the game. The 2016/17 season he was in charge of three Millers games the first one when Wolves were the visitors in a game which ended two-all. Danny Ward and Will Vaulks put the Millers two up in the first twenty minutes but George Saville sent Wolves in at half -time with a lifeline of a goal. Wolves defender Dominic Iorfa got a red card after bringing down Jon Taylor when he was last man with a goal from Jon Dadi Bodvarsson on sixty-five minutes giving Wolves a point. His second visit of the season to the New York Stadium saw Reading in town. Rotherham hung on until four minutes from time when Paul McShane scored the only goal of the game. The Millers had Dexter Blackstock and Greg Halford booked that afternoon. We then saw Scott again at the DW Stadium in April 2017 which saw a goal just before the half-hour mark from Danny Ward put the Millers ahead against fellow strugglers Wigan. Five minutes later the hosts equalised with a goal from Gabriel Obertan. Just after the hour mark Anthony Forde put the Millers back in front but goals from Alex Gilbey and Nick Powell gave Wigan all three points. Yellow cards went to Lewis Price and Darnell Fisher for the visitors and Wigan’s Nick Powell. Scott was in the middle for two Millers games the season before the first being in October 2015 at the IPro Stadium when Derby County ran out three-nil winners. Scott showed yellow cards to Joe Mattock and Richie Smallwood that day and Derby’s George Thorne. He was also in the middle for our final game of the season at the KC Stadium against Hull City. The Millers went in front on sixteen minutes with a goal from Lee Frecklington – but after that it all went pear shaped with the Tigers going in four-one up at half-time adding a fifth just before the hour mark. The only booking of the day was for Stephen Kelly of the Millers. January 2015 saw Scott in the middle when the Millers were away at Charlton. Jordan Cousins scored for the hosts on the eighty-third minute but a last minute goal from sub Danny Ward saw the Millers come home with a point. There were no bookings at The Valley that day. Scott was also in charge for our trip to Blackpool just after Christmas which was another one-one game. Emmanuel Ledesma had put the Millers in front only for Dom Telford to equalise six minutes before the end of the game. Lee Frecklington and Ledesma saw yellow that day. Scott was in charge of two of our games in the 2013/14 season – the first being our first game of the season away at Crewe Alexandra who shocked the Millers by going two up in the opening ten minutes with goals from Anthony Grant and Max Clayton. Lee Frecklington pulled one back on the ten minute mark but two minutes into the second half Richard Brindley was adjudged to have clipped the heels of Ryan Colclough and the hosts got a penalty which Harry Davis put away. On the eighty-sixth minute Ben Pringle curled a great shot into the back of the net to make it three-two and with practically the last kick of the match the Millers earned a point when a loose ball fell to Frecklington who fizzed it into the back of the net to send the travelling supporters home happy. Michael O’Connor was the only player booked in this game. Later in the season he took charge of our Johnstone’s Paint Trophy game at the Highbury Stadium against Fleetwood Town. A cold December night saw Jeff Hughes put the home side in front under twenty minutes into the game with Nouha Dicko getting an equaliser eleven minutes into the second half. But the hosts got a winner seventy minutes in from Conor McLaughlin. April 2013 saw Scott in the middle for our home game with Exeter City which was a four-one victory for the Millers with goals from Ben Pringle, Daniel Nardiello, Michael O’Connor and Craig Morgan and a Grecians consolation goal scored by Daniel Coles. That day Scott booked two players, both from City. In his six games so far this season Scott has shown sixteen yellow cards and two red cards. 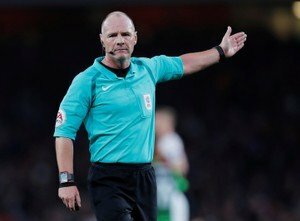 Running the line on Saturday we have Akil Howson and Mark Jones while Oliver Langford from the West Midlands is the fourth official.